Did you know there’s a way you can help prevent weight gain — and possibly even encourage weight loss — without dieting? The secret: fill up on fiber. According to a study in the Journal of Nutrition, boosting fiber by 8 grams for every 1,000 calories consumed resulted in losing about 4½ pounds over a 20 month period. Another study published in the Annals of Internal Medicine found that adults who simply upped their fiber intake to 30 grams per day lost more than four pounds in a year. Sounds simple, right? Yet few of us are meeting our fiber needs. Women should have about 25 grams a day and men at least 35 to 40, but the average person consumes only about half of what they need. 1. Befriend beans… and peas and lentils. One easy way to add fiber to your diet is by incorporating beans, peas and lentils into everyday meals. They’re a rich source of fiber, as well as protein, vitamins, and minerals. For instance, half-cup serving of black beans has a colossal 8g fiber and more than 7g protein in about 100 calories. Beans, peas and lentils also bring delicious flavor and texture to soups, salads and entrees. For a tasty salad, try this Black Bean and Avocado recipe. 2. Go nuts! Surprised to hear that nuts have fiber? Some varieties do! For example, a one-ounce serving of almonds has 3.5 grams of fiber, while pistachios and hazelnuts weigh in at 3 grams per serving. They’re also rich in protein, vitamins and minerals. What’s more, studies show that nut lovers are thinner than those who avoid or rarely eat nuts. Why? Researchers suspect that the fiber and protein in nuts provide a 1-2 punch to help curb hunger and keep you full for longer. Walnuts are another great nut option – enjoy them in your salads and entrees. For a delicious snack, try these Parmesan Herbed Walnuts. 3. Veg out. Another reason to eat your vegetables: fiber! Veggies are high in fiber and relatively low in calories, so they’ll fill you up, not out. 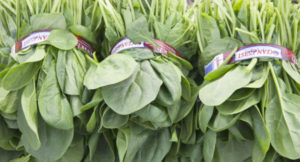 Top fiber picks include spinach (5 grams per cup), artichokes (7 grams for 1medium-sized), and Brussels sprouts (over 3 grams per cup). A recent survey found that less than 4% of Americans eat the recommend 2-3 cups of recommended veggies each day. Help bridge the veggie gap by adding them to your omelets, soups, salads and sandwiches. 4. Grab some fruit. Like veggies, fruit also provide fiber and essential nutrients, in few calories. Some high fiber favorites? A medium apple – under 100 calories – packs a powerful satiety punch with 4.5 grams of filling fiber. What’s more, research reported in the journal Appetite showed that women who added three small apples to their diet each day lost a little more than two pounds in 10 weeks—more than dieters who did not include the fruit in their diet. Another fiber-filled fruit favorite? Pears. A medium pear provides 5.5 grams of fiber! And don’t forget dried fruit. Dried apricots, dates and prunes are a perfect fiber-rich addition to cereals, trail mix and salads. 5. Go with whole grains. Adding whole grains to your daily meals will quickly help you meet your daily fiber quota. Love oatmeal for breakfast? A 1-cup serving provides 4 grams of fiber, along with complex carbohydrates to fuel your day. For lunch, use 100% whole wheat bread (2 slices provide about 4g fiber). For dinner, forget white rice and opt for a flavorful, fiber-rich grain like bulgur or barley that have nearly 3 grams of fiber per serving. Fiber is such a great (and forgotten) part of healthy weight loss. I think a lot of people are surprised by the fiber and protein in nuts and how they combine to help with weight loss. The only problem with nuts is that it’s easy to “go nuts” with them and overeat. For that reason, I try to avoid them as a snack, and instead load them on my salad or oatmeal.